- COMPATIBILITY:perfectly compatibile with Android tablets PC and smartphones, such as Huawei, SONY, MOTOROLA, OPPO, XIAOMI, ZTE, LG, HTC, etc.IOS system, ios Phone (no synchronous APP can be installed). - Multi-FUNCTION:sleep monitoring,sedentary reminder,pedometer,record your daily steps ,fat,speed and mileage.remote camera,anti-lost,music player,calculator,alarm clock,calendar,file manager , in addition sound recorder and built-in camera (pls insert a TF card). - HD SCREEN:240 x 240 pixels resolution.1.54" high-definition TFT LCD.high sensitive capacitive touch screen. 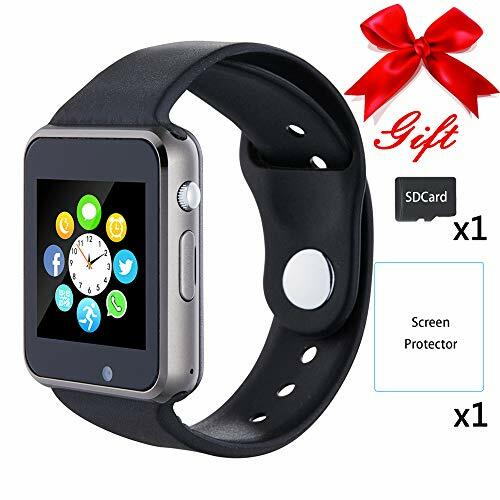 - Attach gift: a screen proctor and a sd card, let this smartwatch bring a better user experience to you.NOTE:If your wrist is too small, the watch may be bigger for you, please choose carefully.